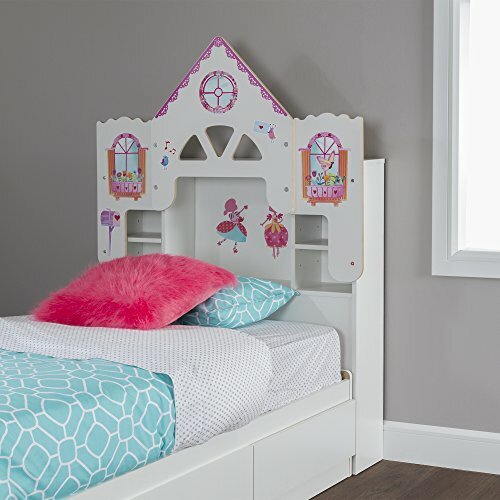 The magic of a doll’s house awaits your little girl while she’s snug under the blankets! This original headboard helps create a setting that sparks the imagination. Otto Graff decals bring the theme to life – a great way to inspire fantastic dreams! And you can take them off without damaging the furniture. When your kid is older, you can remove the whole themed panel so what’s left is a neutral headboard with a built-in bookcase. Can be combined with the bed from our Vito collection (3150212). Themed panel comes off: a handy feature for when your kid is older. Four easy to access storage spaces. Includes decals for you to apply. The drawing is printed on white self-sticking vinyl. Decals come off easily – no damage to furniture. Shelf #1 dimensions: 20.5'' (L) x 7.5'' (D). Shelf #2 dimensions: 8.75'' (L) x 7.5'' (D). Decals included, other accessories not included. Furniture requires complete assembly by 2 adults (tools not included), decals are easy to apply by one person. 41'' (L) x 8.25'' (D) x 61.1'' (H). Box dimensions: 49.75'' (L) x 26'' (W) x 3.1'' (H), 55 lb. Packaging tested and certified to reduce the risk of damage during shipment. Made in Canada with non-toxic laminated particleboard. 5-year quality guarantee. Any questions? Contact the manufacturer, available 7/7 by phone, email or chat.